With a bar and stage at one end, Tantan are hoping to offer live music to customers in the near future. Decor is in keeping with the Moroccan theme but understated and chic: mosaic-tiled tables, African style metal lamps and warm red colours running through the restaurant. We were the only ones in the restaurant at 6.30 that evening…normally a cause for concern for me, but it’s a relatively new venue in a location that’s off the beaten track. We were shown to our table to the restaurant manager – a lovely man who previously ran the Queen Shilling, and with whom Laura and I shared stories of Essex and London…it’s amazing how many people I’ve met since moving here who had an Essex upbringing! Drinks-wise, there’s a reasonable selection of wines from various countries, starting at £2.95 per glass/£11.95 per bottle. No Moroccan wines on the menu here, though. The bar is very well-stocked (apart from the selection of ciders!) with a range of beers and spirits. Turning our attentions to the food menu, we were amazed by the amount of choice – and surprised at the prices. Starters begin at only £3.50 and mains at just £5.50. Vegetarians are well catered for, with a choice of four mains including vegetable moussaka (which I’m sure isn’t Moroccan! ), along with lentil and bean-based dishes. 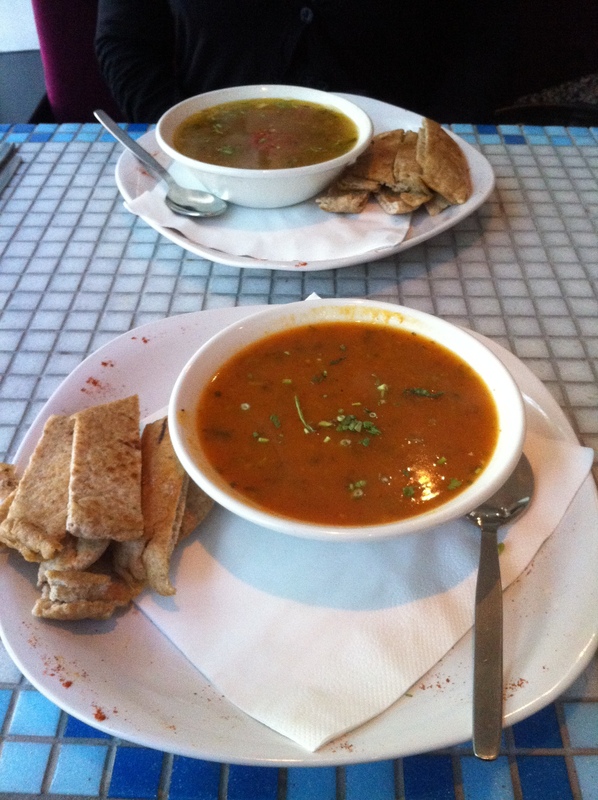 I decided to go for my favourite Moroccan starter of harira (£3.50): a traditional lentil and tomato-based soup with spices and chickpeas. A little bland-tasting at first, the flavour developed slightly as I ate more of it, but not to the extent that I was expecting…and I only ended up with about three or four chickpeas. Laura chose the chourba marinier (£3.95) – a very delicately-flavoured seafood broth with prawns, squid, octopus, tomato, celery onion and herbs, which she enjoyed but said was a little too oily. 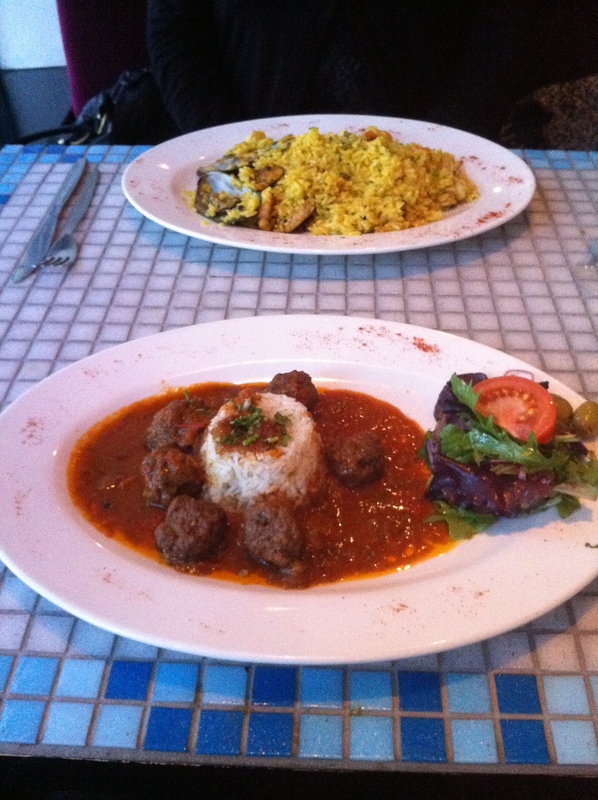 Choosing the main course was difficult, but I eventually decided on the Moroccan kofta (£6.95): small, lightly spiced lamb meatballs in a delicious tomato sauce flavoured with coriander and served with rice, salad and olives. The meatballs themselves were tasty and cooked well, the sauce was full of flavour but the rice, bizarrely, was dry and overcooked in the middle. Laura chose the Moroccan paella (£7.00) and ended up with a huge portion of spiced rice with a variety of seafood and grilled chicken: a main that she was very happy with but couldn’t finish due to its size! Needless to say, we didn’t have space for dessert and so settled the bill and left feeling full. I had a bit of a nightmare at this restaurant. The best thing we had was the chicken koftas however the owner made the mistake of coming out of the kitchen and serving them still clutching the ASDA extra-special chicken koftas wrapper. My main was lamb and prunes with cinnamon. The meat was really poor quality and all I could taste was cinnamon powder for the rest of the evening. I didn't think that the meal was worth the price of the voucher and we were able to get our extra's that we ordered (not on the voucher) free. I too am tasting the cinnamon powder. And the cheap wine, the uncooked vegetables and the sour taste of a wasted Groupon voucher. Never again. In order to make this review more efficient, I am going to divide the problems the business is facing into 2 categories. I booked a table for 4 at 19:30, which I consider a pretty standard time to eat. I had a voucher from a well-known voucher company, which (alas) I pre-paid for. The manager wasn't enormously polite when I booked, but I figured he was having a bad day, or whatever. We arrived on time, and ordered around 19:45. The starters arrived an ENTIRE HOUR later. During that time, we were not asked if we would like more drinks. We also were not updated as to what was going on. The only contact we had with any staff was when the waitress came back after about 15 mins to tell us that several things we had ordered from the menu weren't actually available. There was also an hilarious moment when we were brought glasses of water intended for another table of annoyed customers. We kept them, for the lulz. During this time, most of the other guests left the restaurant, conspicuously not paying or leaving any tips as they did so. We could hear apologies from the very junior staff, and it was obvious that people were unhappy. The manager appeared to spend quite a bit of time hiding behind the bar (he used to run the Queens Shilling, so I supppose he was regressing to a safe, warm, familiar place in the hope that all the bad noises would go away). Awful, with no thought put into our dining experience, bad presentation and terrible cooking technique. I also had to ask for a bowl for the shells and a finger-washing bowl. In any case I didn't use them. I sent the tragi-prawns back to the kitchen, with a tear in my eye for the hundreds of wasted prawn-lives. The staff didn't bother to collect the finger bowls, so eventually I left them on another table on my way out for a smoke (I hadn't eaten my starter so I could, in good taste, smoke between courses. Also, i was bored out of my mind by the wait). Arrived sometime after 10PM. 2.5 hours after we sat down to eat. This kind of delay is simply unacceptable. My lamb tagine had 4 or 5 pieces of 'lamb' in it, that were actually hunks of bone and gristle with a few edgings of meat. The vegetables in the sauce had been rendered somewhere close to liquidity due to overcooking. The sauce itself lacked any flavour at all. There also simply wasn't enough of it (a classic Woody Allen-esque case of 'terrible food, and such small portions!'). If you're making this type of food (which I have at home, with better results), there simply is no reason to run out of it. You make a massive pot of it to begin, and make more as required. I guess Tan Tan don't do it that way though. Baffling, really. 1. Staff casually and openly chatting to friends or showing no urgency with a restaurant half-full of furious customers. 6. No thought put into the basics of dining- where to put shells, when to bring out more cutlery, etc. 7. No cigarette disposal boxes outside, so the butts had to go on the floor (which is technically against the law). 1. Customer service. Apologies were grudging. Staff had given up on decent customer service by 8PM. No professionalism from anyone. 2. The manager. At one point, he poured himself a glass of wine to go with ours, saying he'd had a bad shift. !Newsflash for the manager! We don't care. And drinking on the job is enormously unprofessional, even at the best of times. 3. The food. Very, very poor. 2 of our side dishes were literally a can of tomatoes, a can of mixed beans and some spinach in a bowl. They tasted as though the beans hadn't been rinsed before they went into the dish. If that was their regular chef, then they are in really big trouble going forward, as he doesn't appear to know how to cook. 4. Ingredients. The ingredients were very obviously of poor quality. Even our free glass of wine was pretty shabby (the red drinkable, the white completely unpalatable). Conclusion: Don't ever go to this place. Unless you're scouting for Gordon Ramsey's next series of 'Kitchen Nightmares'. Oh dear. We went fairly soon after we'd opened and did have some issues, but it sounds like they've got worse rather than better. It really does sound like something out of an episode of Kitchen Nightmares. We rang up to book and were greeted with someone who seemed half asleep and not focussing on our call at all, repeating our preferred booking time several times before he seemed to comprehend it! Anyway, we turned up at our alloctated time of 9pm only to be met by the manager who was very keen to turn us away although only one table was occupied. He told us there was lack of choice as all the food had been eaten already and it was in our best interest to go back another time! We left thinking tha we have lost our money as we had bought a voucher for this meal. VERY disappointed. My wife and I were the first customers in at 6pm and needed to leave by 7.25 for a show. Booked using the group on deal. On arrival the restaurant looks like a curry house which has had a cheap overhaul to make it into an "authentic" Moroccan eatery. No drinks menu and the beer is poured from cans which they try to hide. After an awkward start as the new waitress (very helpful) did not know the menu too well we ordered. While waiting for the starters we both used the toilet and came back saying how unclean they were (dirty, soap had run out in both and hand dryer broken) Neither big issues but it all starts to add up. Starters were very poor quality. Falafel and Moroccan Cigars (spring rolls??) were tasteless and probably frozen. These were served with some sloppy hummus which disappointed. We then waited and waited whilst twice being bought food which was not ours including Moroccan bread which was French bread with paprika sprinkled on it. Looking around the other dinners were also having problems with the staff dishing out lots of apologies but not a lot of food. Finally after telling three waiting staff that we needed to leave buy 7.25 we were bought the our food at 7.20. Mine was wrong again so we decided to leave without eating. This is the first time I have ever had to do this. Having already paid up front I explained to the manager the poor service were had received and asked for our money back. He refused and said we would need to claim through Group On as they had no cash on site and would not issue a refund. He didn't actually say sorry until he was really pushed and it ended with me dishing out a few choice words of my own. If you use Group On to kick start a new restaurant you need to make sure its good. I am sure others will spread negative feedback and this will destroy your business. You were given the chance to resolve the issue by refunding but choose not to so this review should come as no shock. 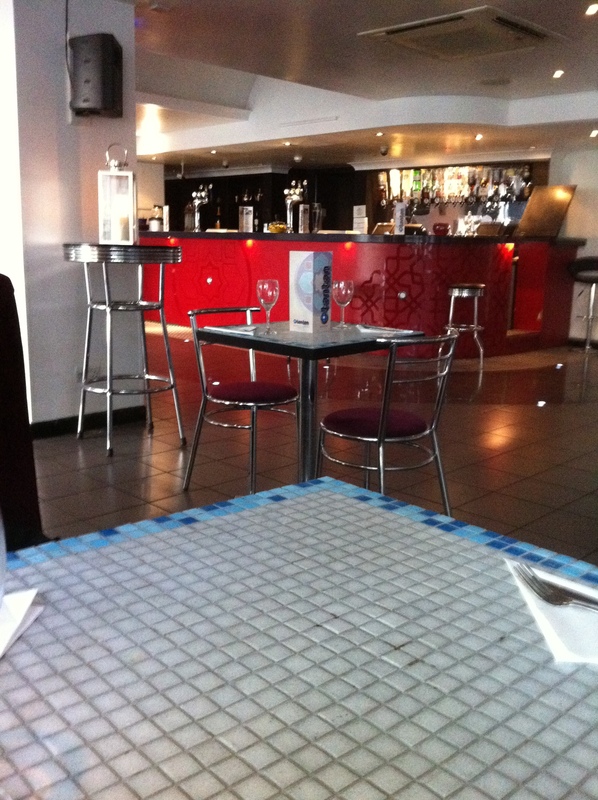 Waiting staff were very polite and apologetic but manager and chef (owner) appear to be the problem. Lots of places to eat in Bristol but don't bother with this one in my view. You can now also leave reviews for Tan Tan on Trip Advisor. Oh no, I've just read these reviews after having already purchased the Groupon voucher. I'm going Wednesday night and now don't have very high hopes! I'll remember to update this site after I've eaten there… Must remember to have a big lunch on Wednesday….. I have it on good authority (a friend who's a Groupon employee, outside Bristol) that restaurants and similar businesses have to purchase a bulk of 3 entries on Groupon when they sign up. So that's why Tan Tan have had 3. I'm imagining that the bad reviews are why Tan Tan / Groupon are rushing the 3rd offer through so close to the 2nd one- in the hope that people will buy the voucher before word gets around about how terrible the place and experience is. Profit is profit, and a loss is a loss, after all. Aha, that could make sense. Although today's one is on KGB Deals rather than Groupon…my theory is that they're struggling to get customers in (I really don't think it's a great location for a restaurant – not much footfall) and relying on the deals sites. Mine is review number 4. It really was terrible. I have aksed Group On for the money back and am awating a reply. I have also sent a request to register the resturant on Trip Advisor. In this day and age a resturant can not get away with such a poor product, enviroment and service. Even at £18 on Group On it is over priced. Sorry to hear you have booked. Maybe worth contacting Group On on the face book page asking for money back due to such poor reviews. Bristol Bites. You can see from the very strong negitve reviews this place seems to have changed for the worse since your review. Oh dear, Sorry to hear about your experience too, Richard. I'd definitely advise contacting Groupon via their Facebook page and via the contact form on their website (http://contact.groupon.co.uk/) – as the purchase was made through Groupon rather than the restaurant itself, they are the ones who will deal with refunds. Very disappointing to hear all of the negative comments about this place. I'd say that I hope they can turn things around, but I think it may be a bit too late for that. I got a refund from Groupon for this deal and would recommend anyone else upset by their experience to apply for a refund also! Groupon also said they have stopped working with this partner. We booked a table for 4 at 8pm on the 30th July with the groupon voucher. We arrived in time and stood at the bar EVENTUALLY a barman appeared (who we later found out was the owner) ……no draught lager/cider, small bottles of becks was the only availability. This should have been an omen – 45 mins later were still stood at the bar no sign of our table. So we asked – the flustered owner was running around like a lunatic, taking order, delivering food, topping up drinks. He laid a table right next to the kitchen door, infact 1 of our party might as well have been sat in the kitchen !! We then attempted to order HERE GOES …….the starters about 12 on the menu only 5 available which consisted of fish or veg…….while we had been looking at the menu we couldnt help but notice the odd atmosphere…there was definate unease hardly any food being served and LOTS of customers looking at their watches. We asked to see the manager – we said that we had spent £20 on a very poor selection of drinks while waiting to be sat at a rediculous table, then when we tried to order our starters the choice was very poor especially as 3 of us dont eat fish (lots of meat starters but none available). All he did was apologise and suggest that we return on another night !!! VERY VERY POOR he didnt offer us any free drinks or any incentive to return………I will be contacting groupon and getting my money back. I went to tantan on 02/08/11 and I have VERY BAD experience. Everything was wrong since I got there with my friends. We were waiting for a starter about 45 minutes (and it was not busy at all!!!). I wanted to have a lamb on bone for the main, but I only got the bone WITH NO MEAT – REALLY. My friend had a hair in a salad. Together with my friends we thought we are in the program called: "YOU HAVE BEEN FRAMED". Just got back from this restaurant. It was a disaster! First of all we had to wait ages for the food to arrive. Once it was on the table it was really bad: "lamb" which was just bones and no meat at all! The lamb meal supposed to have prunes no appricotes! I don't know how the apricots got in there? My friend who ordered the same dish had only one piece of bone with some poor vegetables. This was exchanged into chicken ( with olives?!) as we've been told that they have run out of lamb ( did they give us a left overs?). If that wasn't enough I found a hair in my side dish which was a salad. At that point we thought that we've been framed. This was a group on paid by my friend. Unfortunately I bought the same deal so I'm hoping that I could claim a refund. had a meal booked for tonight but with the comments read here and from other 'review' sites i think i woud rather find some 'falafel' take away and go sit on the harbour. 1st time i have EVER not even bothered to go to a place and make my own choice but i have not found ONE good review of this place. I completely agree with all the negative comments that have been put on here. I went with three others to this restaurant at the end of July with a Groupon voucher. We only had a choice of 3 of the 12 starters. We arrived at 7.30 starters eventually came at 9pm and one of them was wrong! It was very poor quality but we were starving by this time. After a further 45 mins we asked how long the main course would be and were told that this was just being cooked. At this point we got up and left. The Manager tried to take my voucher but I refused to give it to him. After a little bit of a fight with Groupon itself I did get a refund of the full amount I paid. Well after reading all the reviews I was understandably worried about eating there last nite ,10 of us had booked with a groupon voucher . I was however very pleasantly surprised , the staff were very welcoming and all the food was available ,service was quick and the food was very tasty in fact no one in our party was disappointed with what they ordered. I did speak to the manager who seems a very nice guy and mentioned the reviews ,he did say they do now have a new chef and thanked us for taking a chance. If I had one criticism it would be that rice should come with the dishes. However at £7.60 for 2 courses and a drink im not complaining. !! I also recently purchased a groupon voucher and after reading all of the reviews was a bit scepticle about visiting tantan but i took a chance anyway, on arrival myself and my partner were pleasently greeted by the staff and shown to our table, everything was available to us on the menu, we ordered our starters i had the moroccan cigars and my partner had the mini chicken meshoui, they both arrived quite prompt and the presentation was fantastic not to mention the flavours, once we had our starters our mains arrived shortly afterwards i had the chicken har and my partner had the moroccan lamb, they were both outstanding the chicken was so suculant and delicious it just fell apart, and the lamb well it was the best ive ever tried, it was cooked to perfection and the taste was exqsusite my partner also was completely blown away, the food is far to cheep for the quality and we will be returning very soon aswell as recommending it to every person we know. the staff were also very polite and to our surprise we were served by a gentleman from tantan in morocco a definate quality to the restaurant itself, we left o a high note and cant wait to visit again!! It’s refreshing to see that a business can attempt a decent PR-recovery job. Let’s wait and see if the restaurant does improve at all. Kind reviews from friends aside, I mean. Never, ever again. They had no beers on tap ( they said they had a busy weekend) and as I bought the living social social voucher I opted for a glass of rose wine (I swear it was red and white mixed together) and my husband ordered a coffee. We we're then told there was no milk but as we were waiting outside, he came out with a small jug saying he got someone to go to the shops to get some! I ordered chicken skewers to be told there is no chicken. I had the cod instead which was actually raw, can't be 100% but the lighting was too dim to check thoroughly. Husband orderd the beef, to be told there is none so he had to lamb. Wont even go on about the main course, but a tagine is NOT the cheapest, smallest, tasteless lamb cutlets you can find. The sauce was so thin we used the cous cous (which they charged us for) to thinken it up. As for the 'gunpowder tea', it was just boiling water with some mint leaves which was vile. It was just as well neither of us liked it because we couldn't lift the teapot it came in as it felt like it had just come out of an oven. Definitely one to avoid! We went with a Groupon voucher and experienced similar things to other reviewers. My favourite was when my cous cous arrived and wasn't cooked – seriously, how hard is it to mess up cous cous? I sent it back and was promptly given another bowl which also wasn't cooked so I said to the waiter/manager that I'd just have bread. He agreed with me and sad that was probably for the best! I'm all for staff being friendly but when they're joining you in maligning the restaurant something is badly wrong. They were out of lamb when we went but clearly not out of lemons as my tagine was so overpoweringly citrusy it reminded me of washing up liquid. We actually left before having all the food on the voucher as there didn't seem any point hanging round for dessert! I have eaten there 3 times now and taken different friends and family with me every time and we've all been very satisfied and will definitely be returning back again and again. Vladimir Putin issues vouchers now?!?! But seriously, I'd contact the voucher supplier quickly and try to find out- if they're a partner in business then they will be able to help you. What happened? we have the same deal and it seems always closed did you ever manage to get to use your voucher? We went here on October 1st. What a shambles. Despite only being a quarter full, it took 15 minutes to seat us and then there were used glasses on the table. Having bought a voucher from Groupon, we were supposed to get a starter, main course and a drink for two to the value of £40. The first thing we noticed was that the most expensive items would have brought our food bill to no more than £24 excluding the two drinks. When this was pointed out to the manager, he did agree to give us an extra starter rather than a refund, which meant gorging ourselves in order to get our monies worth! It took half an hour for anyone to ask us about our drinks and then took an hour for our starters to arrive. When we did order drinks, despite having an array of pumps on the bar, they had no draught beer. Then they ran out of white wine, leaving red wine as the ONLY option (this was at about 8.30pm). When the food did arrive it was dreadful. The fish tagine had a few pieces of anaemic looking fish in it and the vegetables were clearly cooked from frozen – all watery and limp. The vegetarian option was bland and boring. The people on the table next to us had to ask the manager for salt and pepper, which he promptly gave them from our table, only to discover that they were both empty! We did manage to squeeze a couple of extra drinks out of them to bump up our bill to the value of £40 but this was quite simply the worst dining experience I have ever had. AVOID! !